Two pilots died when a Makalu Air cargo plane crashed in the remote mountainous region of Humla on Wednesday morning. Captain duo Kiran Bhattarai and Aditya Nath Nepali died in the Cessna 208 Grand Caravan crash, the Civil Aviation Authority of Nepal (Caan) said. The deceased Aditya Nath is the son of Captain Phizo Nath, the executive chairman of the airline company. A preliminary report, based on eyewitness accounts, suggests the aircraft was searching for a flat and safe area to land, seven minutes before reaching its destination airport in Simikot, indicating that the plane might have developed some technical problems. “The area was blanketed with light fog. It made 3-4 circles searching for an appropriate area to make an emergency landing,” an eyewitness is heard saying on a video clip obtained by the Post. “It went down and again flew over a hill. It finally prepared to touch down on a grassy area which was ‘good enough’ to land after making rounds. But it hit the earth,” the eyewitness said. Photographs of the crash site shows the aircraft bounced off the mountain some 60 metres away from the first impact point. “The aircraft has been broken into pieces. The pilots might have died due to the impact,” said a Caan official. Noodles, biscuits and other food stuff packets were strewn across the crash site. The plane was carrying 1,170kg of cargo, which according to Caan, is the permissible limit. This implies that the pilot was gliding the plane to make an emergency landing on a grassy land, said the Caan official. Unlike multi-engine aircraft which often nose dive straight down in such a situation, the single-engine planes can glide without engine power during descends. According to Pratap Babu Tiwari, chief of Nepalgunj Airport, the Cessna made last contact with the air traffic controller at Nepalgunj at 6:27am. “Everything appeared normal until that time. 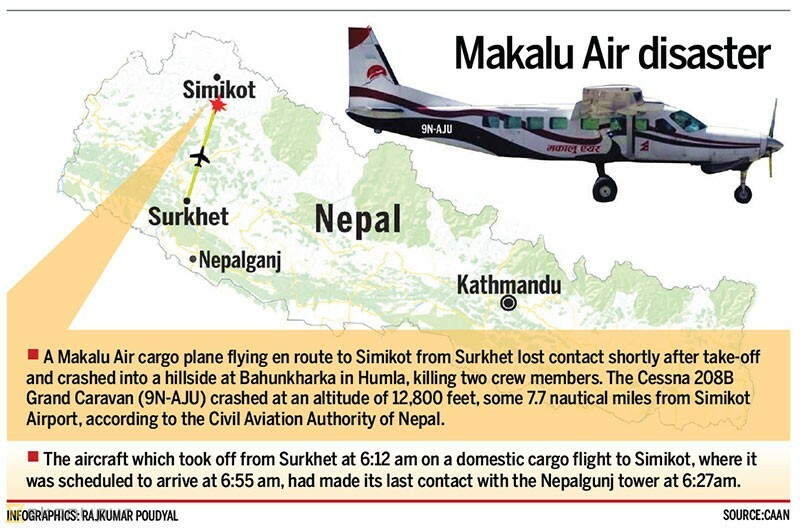 The pilots of the aircraft had also communicated with another plane—Sita Air—flying on the same route minutes before the crash.” The aircraft had flown from Surkhet Airport at 6:12 am carrying food stuff and was scheduled to land at 6:55am in Simikot. The wreckage of the plane was found at 12,800 feet after two hours of search. The nature of the crash is—Controlled Flight into Terrain (CFIT), according to aviation experts. This means, an airworthy aircraft, under pilot control, unintentionally hit the terrain. In August 4, 2016, another Cessna 208 Grand Caravan of Makalu Air plane flying from Surkhet to Simikot, made a forced landing in the Karnali River following a loss of engine power. Both the crew members had jumped into the river and swam ashore. The aircraft was swept away by river currents. The government on Wednesday formed a four-member panel under former Caan director general Tri Ratna Manandhar to investigate into the crash. Upendra Lal Shrestha, senior engineer of Buddha Air; Gopal Bista, senior captain of Nepal Airlines are members on the committee. Buddhi Sagar Lamichhane, joint-secretary at the Tourism Ministry, has been named the member-secretary of the panel.